The armed forces trying to disperse protesters in Caracas on January 23. 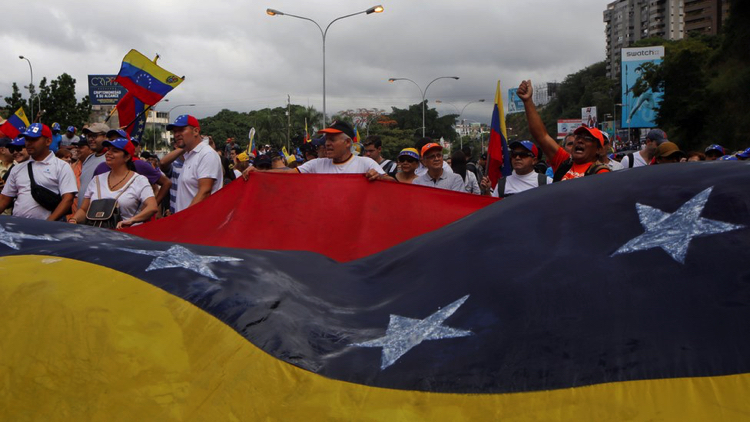 Thousands of people expressed themselves on January 23 against the government of Maduro. The SOS Venezuela movement convenes this Saturday, February 2, at 12 noon in the morning concentrations in more than 200 countries around the world to demand the "restoration of democracy" in this country, convulsed by a serious political and economic crisis . In Barcelona, ​​the concentration will also be at 12:00 in Plaça Catalunya. According to the spokesman of SOS Venezuela in Barcelona, ​​David Díaz, the country is at a "crucial moment." "We have to be in the expectation to rescue the constitutional thread and look closely at what happens in Venezuela after a week full of transcendental events for democracy in the country," says Diaz. And the events of these days have triggered hundreds of arrests, demonstrations, deaths and repressions towards a high population that demands free elections. On January 23, Juan Guaidó, the president of the National Assembly, surprised the world assuming responsibilities as temporary president outside the current government of Ignacio Maduro. He did this during the march to commemorate the end of the dictatorship of Marcos Pérez Jiménez, on January 23, 1958. As of that moment the political and institutional crisis between the government officials of Maduro is generated that the power and the opponents of the government of Guaidó do not stop. To all this, the international powers have already been positioned and the EU has given 8 days to Maduro to convene free elections in the country, alleging as "illegitimate" the elections of May 2018 that granted him the power . The term of the 8 days granted ends this Saturday, February 2. The SOS Venezuela Movement has not stopped denouncing internationally the repression that the country is experiencing. "We want to make known the violations of human rights, the political reality of the national assembly, request the support of the EU and restore democracy with Guaidó," says Diaz. The coordinator of the International Criminal Forum in Catalonia, Elisabeth Casañas, claims that since the past January 21 up to now, more than 790 arrests have occurred that add to the 270 political prisoners previously. "People are removed from their homes, plunder schools and arrested minors between 11 and 15 years accused of terrorism," said the coordinator. Until the 21st, the International Criminal Forum has denounced more than 40 murders by firearms. According to Casañas, Venezuela needs urgent humanitarian aid for a long time. "People eat from waste, infant mortality has increased, illnesses that were supposed to be eradicated, and humanitarian channels are blocked." The opponents argue that Madruro won the past elections in an "illegitimate" manner, through elections that only represented 60% of the total suffrage. The UN, the Organization of American States (OAS), the EU and the Lima Group rejected these elections for "lack of transparency and guarantees". SOS Venezuela calls for the cessation of the "usurpation" of Maduro's government, the composition of a new electoral power and independent elections with international supervision.